Porto Alegre (local Portuguese pronunciation: [ˈpoɾtu aˈlɛɡɾi] ( listen); Joyful Harbor) is the capital and largest city of the Brazilian state of Rio Grande do Sul. 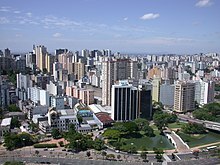 Founded in 1769 by Manuel Sepúlveda, its population of 1,481,019 inhabitants (2016) makes it the tenth most populous city in the country and the centre of Brazil's fifth largest metropolitan area, with 4,405,760 inhabitants (2010). 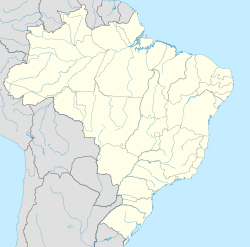 The city is the southernmost capital city of a Brazilian state. Previously a safe city by Brazilian standards, Porto Alegre is going through a growing wave of violence in this decade, and it's now ranked 43rd among the world's 50 most violent cities. There were many wars, but it was the nineteenth century that marked its people, after they fought a long war for their independence from the Brazilian Empire. The Farrapos War started with the confrontation in Porto Alegre, near the Azenha bridge on 20 September 1835. Albeit terminated, this conflict etched in the pages of history the myth of the gaucho that is until our days praised in songs and celebrated in annual pageants and honored as names of streets and parks. Before this, Porto Alegre was the port of Viamão on the shore of Guaíba Lake. Its previous name was Porto dos Casais (Port of the Couples), and it was initially settled by Azoreans. Many families of settlers came from the city of Rio Grande in the littoral Lagunar region, to the south, a military fortress at that time. Today Rio Grande is the most important port of the State of Rio Grande do Sul. The city is also known as "Porto do Sol" (Port of the Sun) and "Cidade Sorriso" (Smile City). More than 70 neighborhoods (see below) are part of the city and two-thirds of the population are concentrated in the Zona Norte (Northern Zone), where most of the economic activity, including the city center, takes place. Porto Alegre has a long coastline on the Guaíba Lake, and its topography is punctuated by 40 hills. In the lake, a vast body of water, a maze of islands facing the city creates an archipelago where a unique ecosystem gives shelter to abundant wildlife. The city area concentrates 28% of the native flora of Rio Grande do Sul, with 9,288 species. Among these, there are many trees which are vestiges of the Atlantic Forest. Fauna are also diversified, especially in the islands and hills. The Portoalegrense environs include many parks, squares and wooded streets. The only snowfall events in Porto Alegre were in 1879, 1910, 1984, 1994, 2000 and 2006, and few of them featured accumulation. Fall tends to be as changeable as winter, but is typically warmer. Spring, stabler akin to summer, is slightly drier than all the other seasons. Occurrence of radiation fog is common, causing several delays in early flights. Unlike other large Brazilian cities much farther north, notably Brasília, São Paulo, and Rio de Janeiro who observe a pronounced summer maximum in precipitation amounts, the city of Porto Alegre experiences a prominent winter maximum in precipitation values and cloud cover, for the summer season is primarily hot and dry; though evidently high humidity levels often give a distinct mugginess to the air and negatively impacts air quality. Annually Porto Alegre receives an average-total precipitation amount of 1,348 millimetres (53.1 in). This average makes the city slightly wetter than Rio at 1,172 millimetres (46.1 in) yet, to a considerable extent, drier than both São Paulo at 1,457 millimetres (57.4 in) and Brasilia at 1,557 millimetres (61.3 in). The highest recorded temperature was 42.6 °C (108.7 °F) while the lowest recorded temperature was −0.3 °C (31.5 °F). Sewer service is available to 87.7 percent of the city, and 100 percent of the population is serviced by treated water. While in most Brazilian cities the water is supplied by large state companies, in Porto Alegre the Municipal Department of Water and Sanitation Services, (DMAE) is the provider. It is the largest municipal water supplier in the country and enjoys operational autonomy and financial independence. As a separate entity from the municipal government it can make its own decisions on how to invest revenues it has collected, and such decisions are not directly subject to interference from the municipality. It receives no subsidies and makes no payments to the municipality itself. As a municipal undertaking, DMAE enjoys tax-exempt status, which allows it to keep water prices lower. Inter-American Development Bank (IDB) approved a US$83.2 million to support the Integrated Socioenvironmental Program of Porto Alegre. The program will be carried out by the Municipal Department of Management and Strategic Support and will focus on improving water quality in Guaíba Lake and the Cavalhada River, developing urban infrastructure to reduce flood risk along the Cavalhada River, improving the environmental management in the Municipality of Porto Alegre, and promoting efficient municipal water, sanitation and storm drainage services. This program will improve the quality of life of the population of Porto Alegre by restoring water quality along the west side of Lake Guaíba and directly benefitting more than 700,000 residents through expanded public sanitation services and urban environmental improvement. Panoramic view of Centro Histórico, Cidade Baixa, Santana and Bom Fim neighbourhoods in Central Zone of Porto Alegre. The executive branch is represented is by the municipality, its departments and other public administration bodies directly and indirectly. The legislature is represented by the City Council. Among the main businesses located in Porto Alegre are Gerdau, Petroleo Ipiranga, Zaffari and RBS. Since 2000, General Motors (GM) is operating in Gravataí, located in the Metropolitan Region. Also in this Region but in Triunfo, there is a Petrochemical Pool, and in Eldorado do Sul Dell Computers has established a plant. In the health sector, the three hospitals: Hospital Moinhos de Vento, which is a private, JCAH-accredited hospital, Santa Casa de Misericordia Hospital and Clinicas Hospital, public, are considered among the best in Latin America. The latter are university-affiliated, referral hospitals for the South of Brazil. 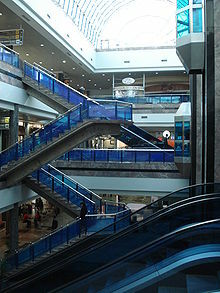 Commerce is a very important economic activity, with many malls (like Praia de Belas Shopping, Shopping Iguatemi and the smaller though posh Shopping Moinhos). The Metropolitan Region of Porto Alegre, directed to the production of shoes (around Novo Hamburgo) and to petrochemical industries, as well as services. Educational institutions in the area include Universidade Federal de Ciências da Saúde de Porto Alegre (a.k.a. UFCSPA), Universidade Federal do Rio Grande do Sul (a.k.a. UFRGS), Pontifícia Universidade Católica do Rio Grande do Sul (a.k.a. PUC), Universidade do Vale do Rio dos Sinos (a.k.a. Unisinos) and Centro Universitário Ritter dos Reis. There are three important universities in Porto Alegre: the Federal University of Health Sciences of Porto Alegre (UFCSPA), the Federal University of Rio Grande do Sul (UFRGS) and the Pontifical Catholic University of Rio Grande do Sul (PUCRS) all of which ranked among the top universities in Brazil and Latin America. UFRGS is also one of the 3 main universities in the country for post-graduation work. The PUCRS technological park – TECNOPUC – is one of the largest scientific and technological parks in Latin America with interaction of graduate courses, research and innovation. PUCRS is also one of the best universities for air transport and pilot formation in the world. Other very important universities are ULBRA and UNISINOS, among other university centers. Created in 1903, this is the oldest museum in the state. Its collection comprises thousands of pieces related to the local history, from Indian relics to objects and iconography about the Ragamuffin War and the Paraguayan War, including an important section showing fine sculptures from the Jesuitic Reductions. Joaquim José Felizardo Museum This is an important museum with a large collection of archaeological artifacts and fotographies of Porto Alegre's old times. Its historical building, dating from 1845–55, is one of the few intact relics of colonial architecture inside the modern urban environment. This museum displays a huge collection of documents, maps, objects, prints and other items related to the state's history. Its building, designed by Theodor Wiederspahn, is one of the finest examples of eclectic architecture in the city. An iconic landmark in the southern part of Porto Alegre, the Iberê Camargo Foundation houses the permanent installation of gaucho artist Iberê Camargo. It also hosts traveling exhibitions which change several times a year. The building, designed by Portuguese architect Álvaro Siza was opened in 2008 and offers views of the Guiaba river as well as downtown Porto Alegre. Projected by Oscar Niemeyer, the Luiz Carlos Prestes' Memorial is a recent addition to the city' cultural landscape. Besides the wall presentation of Prestes' life, a hall for cultural, social and political events is placed to the citizens of Porto Alegre. The traditional beverage is chimarrao, a South-American caffeine-rich infused drink. The Chalet of the XV de Novembro Plaza is located along the Glênio Peres Square, it is one of the most traditional bar-draught beer-restaurants in the city, where the last "lambe-lambe" photographs of the region work. "Lambe-lambes" are photographers who develop pictures outdoor using the oldest method known. In the Bavarian style, with art nouveau traits, the centenary Chalet was built up on a demountable steel structure, keeping its original chandeliers and tiles even nowadays. World Social Forum: On several occasions (2001, 2002, 2003, 2005) the World Social Forum has been hosted in Porto Alegre. This event gathered more than 100,000 people from more than 100 countries each year. The main aim of these meetings is to discuss and deal with social issues. Bookfair: Held each November at Alfândega Square. In October Porto Alegre holds the greatest Book Fair in the Americas, an event that has been taking place since 1955. Each year about 2,000,000 people attend this fair. Carnival: As do other Brazilian cities, Porto Alegre holds extensive festivities during the period immediately preceding Lent. Among them, there is an Escola de Samba contest, featuring Academia de Samba Puro, Acadêmicos da Orgia, Bambas da Orgia, Estado Maior da Restinga, Fidalgos e Aristocratas, Império da Zona Norte, Impeadores do Samba, among others. Salgado Filho International Airport serves commercial flights to most major cities all over Brazil and to smaller cities in the South of the country. There are also international flights to other South American countries, Panama, and Portugal. Trensurb is operated jointly by the federal government, the state government of Rio Grande do Sul and the city of Porto Alegre through the company Trensurb S.A. (Company of Urban Trains of Porto Alegre S.A.) and has 22 working stations, with a total extension of nearly 43 kilometres (27 mi), carrying about 130,000 users a day. Building of the (sole) Line 1 of the metro started in 1980. The choice of path was made to relieve the heavy traffic of highway BR-116, which already presented serious problems with the transit at the time. The line was inaugurated on March 2, 1985, between the Central Public Market and Sapucaia do Sul. In December 1997, it was extended to Unisinos. An extension of 2.4 miles (3.9 km) São Leopoldo–Museum was added in November 2000, after two months of trial service. As of 2013[update], an extension to Novo Hamburgo is being completed, with the first station already fully functional. The city has a functioning transportation system, especially the autobuses. Porto Alegre has also mini-buses from and to all the main neighborhoods in the city, with sitting-only transport and the possibility to hop on and off at any point but also higher fares. Linha Turística (Tourist Line) is a bus that leaves from Usina do Gasômetro tourist terminal around six times per day. During 90 minutes, it traverses the various districts of Porto Alegre, for a modest price. Exclusive bus lanes in the median of seven radial corridors that converge on the city center are used by both urban and regional lines. The bus fleet totals 1,600, with 150 minibuses. About 325 million people use the system annually. Those lines have no prefix. It is quite common to switch buses at downtown but since there is a myriad of lines there, it can be challenging to find the right terminal for the next bus. Transversal lines prefix "T" (T1, T2, ..., T11), connect different neighborhoods without going through the downtown area, which effectively eliminates the need of changing buses for the most common trips. Circular lines prefix "C" (C1, C2, C3), as the name indicates, run in a circular manner, usually connecting parts of the downtown area to the nearest neighborhoods. Mayor José Fogaça renewed his agreement with EMBARQ and the Center for Sustainable Transport Brazil (CTS-Brasil) to improve accessibility and mobility in downtown Porto Alegre. The agreement, signed on March 11, includes a new partnership with the Andean Development Corporation, a Latin American multilateral financial institution that is expected to provide $1 million in non-reimbursable technical assistance to help Porto Alegre complete the preparation phase of the "Portais da Cidade" bus rapid transit project, a groundbreaking transport system designed to reduce pollution and congestion downtown. The system will include a southern extension to accommodate activities for the 2014 FIFA World Cup. CAF's technical assistance will be administered through CTS-Brasil, which has been working to expand sustainable transport in Porto Alegre since 2005. The bus station downtown and is served by several national and international lines. It is also connected to a Trensurb station (Porto Alegre Metro) and several municipal bus lines. Northbound passengers can rely on good bus connections throughout Brazil. However, an express bus might be recommended to travel to Uruguay or Argentina to avoid several stops en route. Beira-Rio Stadium, home of Sport Club Internacional. Arena Grêmio, home of Grêmio Foot-Ball Porto Alegrense. Football is a passion of the people from Porto Alegre. There is a big rivalry between two football clubs, Grêmio Foot-Ball Porto Alegrense, founded in 1903, and Sport Club Internacional, founded in 1909. Grêmio Foot-Ball Porto Alegrense and Sport Club Internacional currently play in the top league in Brazil, the Serie A. Both have successful histories, having won national and international titles, including the South American top honour, the Copa Libertadores, and the highest global trophy for football clubs, the Intercontinental Cup, now known as the Club World Cup. Porto Alegre was one of the host cities of the 2014 FIFA World Cup held in Brazil. The modernization of the Beira-Rio Stadium, home of SC Internacional and the city's 2014 FIFA World Cup venue, left the venue with a capacity for 56,000 spectators. Internacional's former home, the Estádio dos Eucaliptos, was a venue for the 1950 FIFA World Cup. Local rivals Grêmio play in their own stadium in the Humaitá district. The Arena do Grêmio stadium replaced the Estádio Olímpico Monumental in 2012 and meets UEFA/FIFA standards. The Arena do Grêmio stadium has a capacity for 60,540 spectators. On January 22, 2015, Porto Alegre hosted its first Ultimate Fighting Championship event at the Gigantinho. UFC Fight Night: Bigfoot vs. Mir was headlined by former heavyweight champion Frank Mir making his Brazilian debut, knocking out Brasilia native Antônio Silva. ^ "Violence rises in Porto Alegre, affecting already battered economy". ^ "The 50 most violent cities in the world". ^ a b c d e "PortoAlegre.travel". Portoalegre.travel. Archived from the original on 13 October 2017. Retrieved 12 October 2017. ^ "History of Porto Alegre". Sustainablecities.net. Archived from the original on 2010-06-05. Retrieved 2010-10-21. ^ "Porto Alegre Resort - Hotel - Tourism". Meja-kotak.blogspot.com. Retrieved 12 October 2017. ^ "Duracao do Dia". astro.if.ufrgs.br. Retrieved 12 October 2017. ^ "GaúchaZH - notícias, porto alegre, grêmio, inter, colunistas, jogos ao vivo e mais". Zh.clicrbs.com.br. Retrieved 12 October 2017. ^ "Porto Alegre registra granizo em dia mais quente de 2014, diz meteorologia". G1.globo.com. 18 January 2014. Retrieved 12 October 2017. ^ "Frio se intensifica no RS e Porto Alegre pode ter neve nesta quinta". G1.globo.com. 4 June 2012. Retrieved 12 October 2017. ^ Alegre, Prefeitura Municipal de Porto. "CEIC - Centro Integrado de Comando da Cidade de Porto Alegre". 2.portoalegre.rs.gov.br. Retrieved 12 October 2017. ^ a b "Station Porto Alegre" (in French). Meteo Climat. Retrieved 20 October 2018. ^ "Normais Climatológicas Do Brasil" (in Portuguese). Instituto Nacional de Meteorologia. Retrieved 20 October 2018. ^ "Green areas in Porto Alegre". Sustainablecities.net. Archived from the original on 2010-06-05. Retrieved 2010-10-21. ^ Alegre, Prefeitura Municipal de Porto. "DMAE". 2.portoalegre.rs.gov.br. Retrieved 12 October 2017. ^ "Water system in Porto Alegre". Sustainablecities.net. Archived from the original on 2010-06-05. Retrieved 2010-10-21. ^ "Integrated Socioenvironmental Program of Porto Alegre". Zimbio.com. Archived from the original on 2010-07-12. Retrieved 2010-10-21. ^ "Porto Alegre é a segunda capital do Brasil com mais poluentes no ar". Clicrbs.com.br. Archived from the original on 13 October 2017. Retrieved 12 October 2017. ^ "Air quality in the city". Sustainablecities.net. Archived from the original on 2010-06-05. Retrieved 2010-10-21. ^ a b "IBGE :: Censo 2010". Censo2010.ibge.gov.br. Retrieved 12 October 2017. ^ "Maiores cidades do Brasil crescem menos do que média nacional, aponta Censo - Notícias - Cotidiano". Noticias.uol.com.br. Retrieved 12 October 2017. ^ Francisco Oliveira (2005-08-01). "Portuguese and Azorian Portuguese in Rio Grande do Sul". Riogrande.com.br. Archived from the original on 2011-05-23. Retrieved 2010-10-21. ^ "Azorean Portuguese origin in Porto Alegre" (PDF). Atlasesportebrasil.org.br. Retrieved 2010-10-21. ^ Francisco Oliveira (2005-08-01). "German colonies in the State of Rio Grande do Sul". Riogrande.com.br. Archived from the original on 2011-05-23. Retrieved 2010-10-21. ^ "A caminho dos 180 anos da imigração alemã (1824–2004)". WEb.archive.org. 12 June 2004. Archived from the original on 12 June 2004. Retrieved 12 October 2017. ^ Francisco Oliveira (2005-08-01). "Italian colonies in the State of Rio Grande do Sul". Riogrande.com.br. Archived from the original on 2008-06-07. Retrieved 2010-10-21. ^ "Polish Brazilian in Porto Alegre". Cekaw.org. Archived from the original on 13 October 2017. Retrieved 12 October 2017. ^ "Jew Brazilian in Porto Alegre". Terrabrasileira.net. Archived from the original on 2011-05-27. Retrieved 2010-10-21. ^ Pena, Sérgio D. J.; Pietro, Giuliano Di; Fuchshuber-Moraes, Mateus; Genro, Julia Pasqualini; Hutz, Mara H.; Kehdy, Fernanda de Souza Gomes; Kohlrausch, Fabiana; Magno, Luiz Alexandre Viana; Montenegro, Raquel Carvalho; Moraes, Manoel Odorico; Moraes, Maria Elisabete Amaral de; Moraes, Milene Raiol de; Ojopi, Élida B.; Perini, Jamila A.; Racciopi, Clarice; Ribeiro-dos-Santos, Ândrea Kely Campos; Rios-Santos, Fabrício; Romano-Silva, Marco A.; Sortica, Vinicius A.; Suarez-Kurtz, Guilherme (16 February 2011). "The Genomic Ancestry of Individuals from Different Geographical Regions of Brazil Is More Uniform Than Expected". PLOS ONE. 6 (2): e17063. doi:10.1371/journal.pone.0017063. Retrieved 12 October 2017 – via PLoS Journals. ^ "Verso". Versobooks.com. Retrieved 12 October 2017. ^ "Home". Polo. Retrieved 12 October 2017. ^ "Porto Alegre". Wcams.com.br. Archived from the original on 2011-04-02. Retrieved 2010-10-21. ^ "Energy in Porto Alegre". Sustainablecities.net. Archived from the original on 2010-06-05. Retrieved 2010-10-21. ^ "Capital é a décima maior produtora de lixo no País - Portal Meu Bairro". Meubairropoa.com. 17 April 2012. Retrieved 12 October 2017. ^ "Recycling program in Porto Alegre". Sustainablecities.net. Archived from the original on 2010-06-05. Retrieved 2010-10-21. ^ "Nightlife POA city". World66.com. Archived from the original on 2011-05-14. Retrieved 2010-10-21. ^ "Nightlife Porto Alegre". Themanual2brazil.com. 1959-01-28. Archived from the original on 2008-12-04. Retrieved 2010-10-21. ^ "Memorial do Rio Grande do Sul". Memorial.rs.gov.br. Archived from the original on 5 September 2013. Retrieved 12 October 2017. ^ "Fundação Iberê Camargo". Iberecamargo.org.br. Archived from the original on 2017-10-13. Retrieved 12 October 2017. ^ "Memorial projetado por Niemeyer em homenagem a Prestes é inaugurado em Porto Alegre". www.gauchazh.clicrbs.com.br. ^ "Carnival of Porto Alegre". Museevirtuel.ca. 1999-04-19. Archived from the original on 2011-07-06. Retrieved 2010-10-21. ^ "King Momo – Carnival, Porto Alegre". Virtualmuseum.ca. 1999-04-19. Archived from the original on 2011-07-06. Retrieved 2010-10-21. ^ "Redirecionando..." Sph.rs.gov.br. Retrieved 12 October 2017. ^ "Distâncias entre as Estações - Trensurb - Empresa de Trens Urbanos de Porto Alegre S.A." Trensurb.com.br. Retrieved 12 October 2017. ^ "Expansão Novo Hamburgo - Trensurb - Empresa de Trens Urbanos de Porto Alegre S.A." Trensurb.com.br. Retrieved 12 October 2017. ^ "Metrô de Porto Alegre". .portoalegre.rs.gov.br. Retrieved 12 October 2017. ^ "Bus System in the city". Sustainablecities.net. Archived from the original on 2010-06-05. Retrieved 2010-10-21. ^ "Bus Transport Project – Porto Alegre". Embarq.org. 2009-03-11. Archived from the original on 2010-07-07. Retrieved 2010-10-21. ^ Alegre, Prefeitura Municipal de Porto. "EPTC". 2.portoalegre.rs.gov.br. Retrieved 12 October 2017. ^ "Porto Alegre Public Transportation Statistics". Global Public Transit Index by Moovit. Retrieved June 19, 2017. ^ Alegre, Prefeitura Municipal de Porto. "SMURB". 2.portoalegre.rs.gov.br. Retrieved 12 October 2017. ^ a b Sister Cities International 2015 Membership Directory, p 53. Sister Cities International. Accessed August 31, 2015. ^ "Marchezan representa a Frente Nacional dos Prefeitos na China". Prefeitura de Porto Alegre. Retrieved 2019-04-13.